Then a fish gets called a common this, or a common that, it usually lads to trouble. Commonality is a relative term. Take for example the fish we now call the Silver Dollar; now, aside from the fact that there a huge number of aquarists keeping this fish that have never seen a silver dollar (or even a dollar for that matter), the fish now sold under this moniker (Metynnis spp.) isn't actually the fish the name Silver Dollar was originally dreamt up to describe. For the aquatic trivia buffs out there the original Silver Dollar is Poptella orbicularis, but at the time it was most commonly available it was imported as Ephippicharax orbicularis. Back to our "Common" pleco. The term common isn't appropriate at the present time. Due to changes in import patterns and more significantly commercial breeding, you will find for sale Sailfin, Snow King or multiradiatus-type suckermouths more readily (and more cheaply) than our Common Pleco. This fish is often referred to as Hypostomus plecostomus, a very similar fish which was previously known as Plecostomus plecostomus. Cosmetically, H. plecostomus is a darker fish with smaller spots (similar to that found on the head of H. punctatus) covering the whole body. The dorsal and caudal fin rays are not striped. It must be said that apart from that differentiation, I am unaware of other differences and literature seems to be in the same state of confusion as myself. 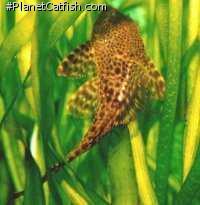 You may well have sussed by now that the generic term Plec or Pleco comes from Plecostomus. This has now spread to a general term applicable to any Loricariid. I suppose this is useful; Zebra Pleco is less of a mouthful than Zebra Suckermouth Catfish. 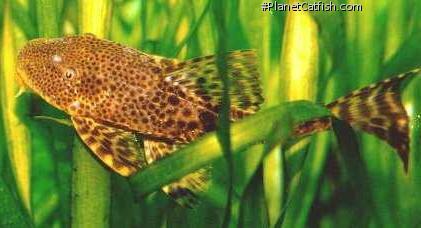 The problem is that the term pleco now references fish that aren't even catfish! (i.e. Hillstream Loaches, Gastromyzon etc are known as Borneo or Hong Kong Plecos). Importers have a lot to answer for! Back to our "Common" pleco that started it all. Perhaps there is still some merit in being the "original". Even if it is unclear what the original actually was! If you follow the aquatic newsgroups online, you will often find the aforementioned generic term referred to as pl*co. This quirkily charming practice arose from a cyber-superstition centering around a number of unexplained pleco deaths. Essentially when a given pleco was discussed via a newsgroup, the unfortunate individual fish perished. Fishkeepers being the superstitious lot that they are adopted the textual equivalent of coded whispering by referring to their beloved plecos as pl*cos to stop the curse. Quaint idea, but it really messes up search engines. Type Locality Rio de Janeiro, Brazil. Identification Hypostomus with a brown colouration and spots are generally difficult to ID with any accuracy. This species has a light brown colouration with very dark brown spots but it is the fact that it is from the Rio Janeiro that makes the ID more reliable. Feeding Lettuce, peas, frozen spinach and any prepared food that reaches the bottom. Larger fish enjoy prawns. Algae (especially soft brown) will be eaten immediately. Will learn to eat floating pellets from the surface if the food drifts to the sides of the aquarium. Furniture An appropriately sized shady retreat is all this fish requires. Will not eat plants, but any individual larger then 10cm or so may inadvertently pull up plants not entirely established. They are more likely to burrow if adequate hiding places are missing. Compatibility Larger individuals are territorial towards conspecifics, however not predatory and able to look after itself. Safe with small fish. Suggested Tankmates Larger individuals are territorial towards conspecifics, however not predatory and able to look after itself. Safe with small fish. Good for an appropraitely sized community tank. Breeding Unreported in the aquarium, but thought to spawn in mud burrows dug into the side of riverbanks.